Ratings are based on a 1 to 5 scale. 1 is horrible. 3 is average. 5 is great. 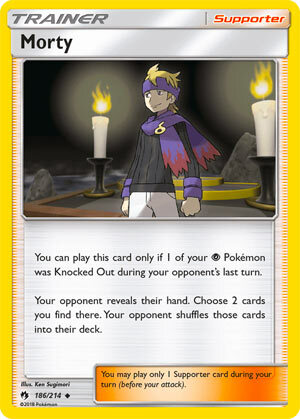 Morty (LOT 186) debuted in the PTCG in the Lost Thunder expansion set. Hard to believe it’s been almost three months since that came out, right? And guess how many times I’ve seen Morty in the time that it’s been Standard legal? Let’s just say that most people could count the number of times on one hand… and still have four fingers and a thumb left over. Yeah not getting into the “Is the thumb a finger?” argument here. And my apologies if that joke offends those of you who are missing any digits on their hands. Morty does fall into the category of Supporters that are far less impactful than they could / would / should be. Seriously, why just Psychics? Why not to the Lost Zone? And why not three or four or a number equal to the amount of Pokemon you have in play immediately after the KO. Yet again, the designers do a great job of creating a card that absolutely no one will use. At this point in the game, you’ve got to sweeten the pot in order to get usefulness out of a card. Just like many of the Supporters coming out of Team Up on Friday, Morty is destined for the binder. Hopefully you haven’t pulled two trade locked FA’s like me (sadness ☹). Morty (SM – Lost Thunder 186/214, 212/214) is a Supporter from what remains the latest officially released expansion until this Friday. He can only be used if one of your [P] Type Pokémon was KO’d during your opponent’s last turn; something KO’d on your own turn or between turns by an effect (Ability, Special Condition, Trainer, etc.) doesn’t count. If the conditions are met and you can Activate Morty, he forces your opponent to reveal their hand to you, then you shuffle two of those cards back into your opponent’s deck. You do get to pick which cards are shuffled back. You do not get to leave your opponent’s hand alone, on the off chance you’d actually help them by shuffling two cards back… which isn’t as unlikely as it sounds given cards like Lillie, Oranguru (Sun & Moon 113/149, SM – Black Star Promos SM13) and (in Expanded) Professor Juniper or Professor Sycamore. The activation requirement is actually quite stiff unless you’re running a mono- or mostly [P] deck, where your opponent will have little choice but to KO [P] Type Pokémon. Even if you have a fairly even split, there’s a big risk your opponent is just as well off KOing whatever is not the [P] Type, be it your attackers or a supporting Bench-sitter… even if they aren’t worried about Morty! Many (most?) decks are running at least one Tapu Lele-GX or Marshadow (Shining Legends 45/73, SM – Black Star Promos SM85) but your opponent isn’t likely to target those things unless the rest of your field looks too difficult to OHKO or incredibly unimportant. KO’s from stuff like Shrine of Punishment can also throw it all off. Part of me wishes self-KOing Pokémon could trigger it, and part of me is scared at the kind of combos that could create, especially in Expanded. The effect is probably better suited to Expanded. How so? As many or more decks that are [P] Type or [P] Type dominated, more control/disruption decks which are proven quantities, and Expanded is better at reclaiming certain key cards from the discard pile than Standard, and sometimes even than Expanded is at searching out those same cards from the deck. Expanded also features more competition, but even Morty doesn’t show up in the highest placing Trevenant BREAK decks from the Dallas, TX Regional Championship, I’ve got to wonder if the deck should have packed one Morty. I’m unaware of a competitive, almost pure [P] Type control/disruption deck like that in Standard… but Expanded also has a lot more competition for deck space. Morty should be great in the Limited Format if you’re running a decent chunk of [P] Pokémon. Your opponent isn’t likely to have a way of ignoring an active [P] attacker or “sacrifice”, or of searching out whatever you shuffle away. The real risk if you’ll find they had nothing worthwhile… but knowing that is still pretty valuable. Morty is one of those cards where the costs are too likely to outweigh the benefits. I like Supporters that are combo-centric but hand control effects are a lot like healing; either they do too much or not enough, with only a few “just right” examples throughout the long history of the game. There’s enough here that I wouldn’t write Morty off completely, and I’m almost worried that he’ll get one. He’s the kind of control element that really only works well when it sabotages an opponent’s would-be comeback against a control deck that has already taken hold. Click here to read our Pokémon Card of the Day Archive. We have reviewed more than 3500 Pokemon cards over the last 17+ years!